From Windows to Wi-Fi, PC expert Josh Norem finds solutions to readers' most vexing problems. When your Windows 10 installation is too big to run comfortably on your drive, shrink it down with Compact.exe, a built-in tool designed expressly for this purpose. Read on for this and other workarounds. The ability to make a recovery disk or USB drive is one of the most useful troubleshooting tools included with Windows 10. If your external drive is no longer detected, don't give up hope. It could be relatively easy to recover the data. GifCam is a super-lightweight, portable utility that captures still and action shots of your computer screen in GIF or AVI form. It's also free, though donations are appreciated. MAME is the name that matters for arcade game and PC emulators. Its aim is to preserve the PC and gaming past—and let you enjoy them once again. Hard drives need defragging. All SSDs can use a good TRIM. But how and when? We'll tell you what to do and not do, and what's being done automatically. Malware or network issues can sometimes change file permissions or disown you. If you're getting a "you don't have permissions" error, here's how to fix it. Jackie P. wanted to be able to reboot her PC and have it automatically open whatever was open when she closed it. Though the solution isn't perfect, it's close! In Sticky Notes once you click "don't ask me again" it won't, so here's how to fix it. Total online privacy is almost impossible, but these steps will get you a lot closer to being as anonymous as possible. 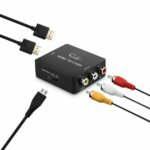 Given a relatively recent PC or laptop, you can connect it to just about any TV with an input.